Infants are cared for in a warm and nurturing environment. Our teachers are passionate about child care and focused on your baby’s advancement and growth. So between the cooing and cuddling, our teachers delight in your baby’s every new step and provide endless opportunities for development and discovery. A day in our individualized program is a fun one indeed, our certified teachers reinforce and constantly engage your baby motor, cognitive, intellectual, sensory, and language development such as stringing sounds together to sound speech: “ba-ba-ba-ba”, point, lift, crawl, walk, planned play, and self-directed play. Older infants begin to develop some understanding about number concepts as our teachers use numbers in everyday activities, sign songs that involve numbers, similarities, differences, and quantity. 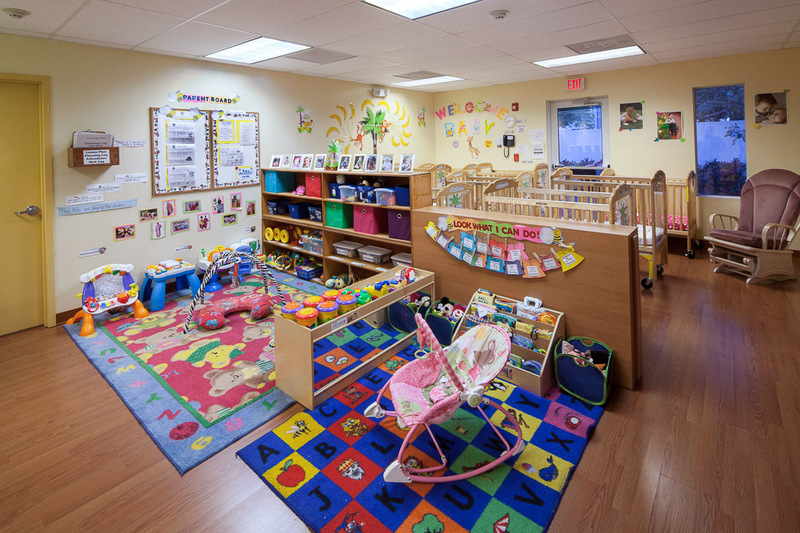 The classroom is designed with age appropriate objects that hang for visual stimulation, textures and colors throughout, and small manipulative toys that even the youngest of infants can grasp. As the infants become mobile and are able to crawl and pull up, they begin to use pull-up and climbing structures, as well as tunnels to crawl through, mirrors to look in, and many kinds of toys that can be pushed, pulled, opened and closed. Walks and outdoor experiences are provided on a daily basis, weather permitting. Each baby is provided with an on-going personal portfolio that will go with them classroom by classroom. Our teachers are mesmerized with all your baby will learn at this age. Each one of them are certified, experienced specialist of this special and tender time of your baby’s life. We are a breast-feeding friendly center and encourage mothers to continue breast-feeding after returning to work. Our staff is trained on how to handle breast milk. Mother’s are welcome to come and breast-feed their child during the day.